On Sunday 15th July a New Victoria X1 (sponsored by Brabners Chaffe Street Solicitors) left the rain of Southport for the blistering hot climate of Bulgaria, seen off by the mayor of Sefton. On the Monday morning New Victoria helped coach a group of Bulgarian children using the kwik cricket equipment that had been brought over from England. After officially handing over a large amount of equipment that had been donated, the Southport League side took on a whole country - Bulgaria! 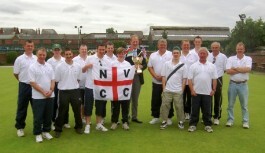 The two teams played for the New Victoria CC Challenge Cup donated by Rewardaward. New Vic batted first with Joe Sawbridge (15) getting the touring side off to a good start. Further runs from Paul Hames (16) and Paul Doran (12) meant a large total was likely. Wickets from Katzazsky (2-35) and Dimitiov (2-16) were the pick of the Bulgarian bowlers. Keith Pacey (29) was going well before colliding with a ball thrown in from the deep and had to retire hurt. With wides and byes adding up to 56 New Vic finished on 160 for 7 after 40 overs. In reply Bulgaria were striking the ball well with Rhiz (17) scoring most of the runs. Colin Fenny (2-3) and Chris Hames (2-4) both took wickets but Bulgaria couldn’t get to grips with the turning deliveries of John Hames (2-0). Bulgaria were all out for 83 with Mushtaq (12*) scoring late order runs. New Victoria (a club side) had beaten Bulgaria (a whole country) by 57 runs. 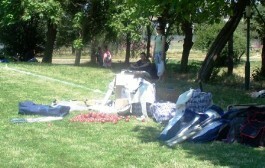 On the second day the teams played a 20 twenty match again at the National Sports Academy in Sofia. New Vic batted first and all the top order made double figures with Sam O’Sullivan (17) leading the way. This time the Bulgarian bowlers were a lot tighter with Iosif (2-10) and Videnov (2-9) starring with the ball. New Victoria finished on 105 for 7. In reply the home side took time to get going with Barry Mills (2-5) bowling well. A partnership between Katzozsky (11) and Videnov (12) got the international side moving in the right direction and then the match winning partnership between Mushtaq (39*) and Saif Rehmen (21*) guided them home by 6 wickets. The Bulgarian’s were over the moon with their victory and hopefully this has provided the home side with a lot of confidence for future matches. On Wednesday New Vic traveled just outside Sofia to play a Bulgarian Embassy X1 including the British ambassador Jeremy Hill. On a lively pitch the embassy batted first with Paul Hames (2-15) taking early wickets. Runs from Taylor (24), Hill (21) and T.Buisseret (20) meant the home side finished on 132 all out. Sarah Addison (2-1), Martin Doran (2-16) and Joe Sawbridge (2-7) all bowled well and the innings was finished off by Dale Johnson (1-1). T.Buisseret (3-7) provide the New Vic openers with a stern test but runs from Dale Johnson (31*) meant that New Vic won by 4 wickets. Martin Doran (16), Paul Hames (15), Joe Sawbridge (10) and Barry Mills (16*) all contributed to the victory. Chairman Peter Hames launched the ball out of the ground to finish the game. Everyone had a wonderful time, the Bulgarian’s had a lot more equipment and then on our return both matches at the weekend were rained off. Maybe they should relocate the Southport League to Bulgaria! 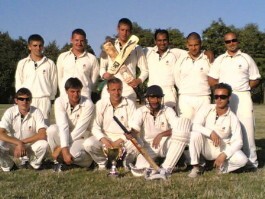 The Bulgarian Cricket Association are looking for other teams to tour the country and especially play the Bulgarian team. Interested teams should contact Owen Jamieson to arrange this. Everyone on the tour would like to thank Owen Jamieson for organising the tour, Saif Ur Rehmen (New Victoria’s overseas player) for making us so welcome and all the UK sponsors. Plans are already being made for a return visit next summer.